Join us at Bridges for an afternoon of rock music, rock climbing, and general romping. If the weather cooperates we will have the music out in the amphitheater. The Mezzanine is off limits this year. Bridges is located at 477 N. 5th Street and is easily accessible from North Parkway. Parking is available on the roof. Please enter through the front door. 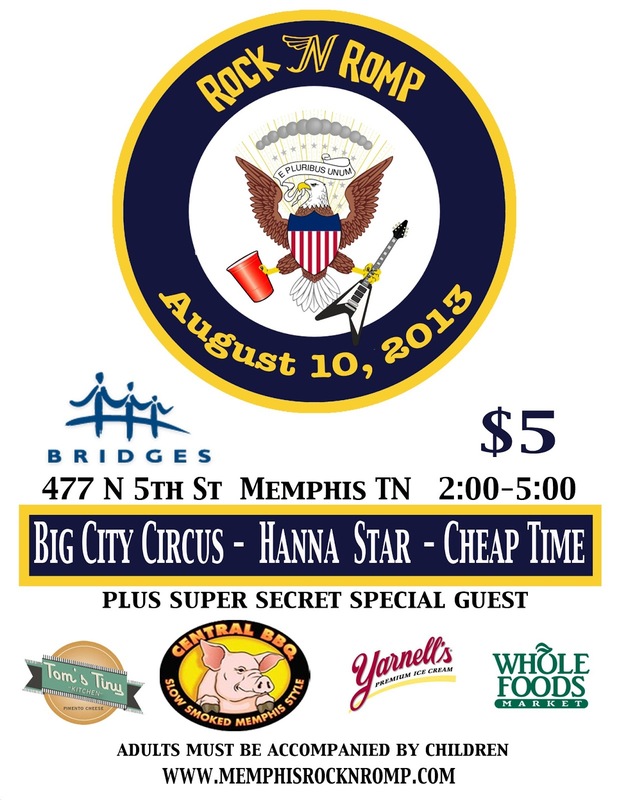 Big City Circus, Hanna Star, and Cheap Time will be playing. We also have Kid President! The Bluff City Brewers will be on hand again to serve their amazing homebrew (Kolsch, Special Bitter, Belgian Golden, Strong Ale, Hefeweizen, Pineapple Pale Ale, Belgian Pale Ale, Extra Special Bitter, Centennial Blonde, Begian Taflebier & English Mild). We'll have the usual Central Barbeque awesomeness as well as healthy snacks from Whole Foods, copious amounts of pimento cheese from Tom's Tiny Kitchen and ice cream sandwiches from Yarnell's. Bricks 4 Kidz, a new program in the Memphis area that encourages STEM learning using LEGO (R) bricks, will be at the Rock-n-Romp this Saturday leading crafts using LEGO "contraptions." We ask each adult to donate $5 at the door to cover our venue, music, & sound costs. Feel free to bring a blanket or chair and a snack to share. Adults must be accompanied by children. Bridges will have the climbing wall open, but there is a $5 charge per climb or $10 unlimited climbing. Adults will not be allowed to climb if after drinking MORE THAN ONE beer, so plan accordingly. Everyone who wishes to climb will also need to sign a waiver. It can be done onsite or online.